SINGAPORE [15 AUGUST 2014] – On 15 August, The Livescape Group, the organizer behind Southeast Asia’s largest music festival, Future Music Festival Asia, announced phase one of the confirmed artists slated for its brand new concept festival, IT’S THE SHIP, Asia’s largest music festival aboard one of the world’s largest cruise liners, Royal Caribbean International’s ‘Voyager of the Seas’. With the festival set to attract regional and international music-lovers for its inaugural sail, IT’S THE SHIP embarks from Singapore on 21 November and will return to shores on the 25 of November via the straits of Malacca. International and regional headliners will perform on multiple stages full steam ahead in a first-ever journey of this magnitude in Asia. As a key highlight, the cruise liner will dock in the tropical island of Langkawi for a star-studded day beach party of epic proportions on November 23. A registration system, housed at www.itstheship.com, is now in place in order to encourage mixed diasporas on board the cruise. The cabins, for all five days and four nights on board IT’S THE SHIP will range from USD $430 (early bird price) to USD4,000 per person for the wickedly luxurious ‘royal suite’ which boasts a grand piano as part of the amenities. Prices are also inclusive of main meals, selected non-alcoholic beverages and free usage of most of the ship’s facilities. Response to pre registration, an option that launched just seven days ago, has proved extremely positive with over 10,000 people registering their interest to purchase cabins on board IT’S THE SHIP. The floating music festival is expected to attract over 3,800 fans of which 60% are expected to come from outside of Singapore. Participation is expected from countries including Australia, Thailand, Indonesia, Philippines, Hong Kong, and even from Europe and the USA. 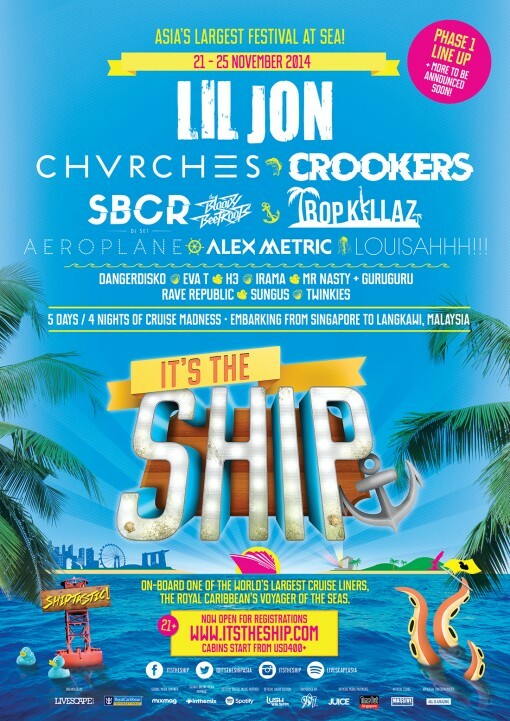 Phase 2 of IT’S THE SHIP lineups will be announced in September. 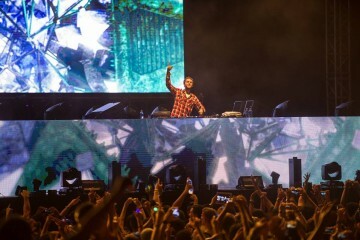 For more information on cabin options and prices, logon to www.itstheship.com. Livescape however has dropped hints that phase two of the artist line-up will include a heavier list of EDM acts including “two to three marquee headliners”. “In true Livescape fashion, expect positive surprises. There is always an element of surprise with us so trust us when we say there will be many more acts to add to the lineup we have just announced. To those who have yet to register, we urge them to do so as soon as possible as we are expecting a sold out cruise,” added Iqbal. For instant updates or queries on the festival, follow IT’S THE SHIP on www.facebook.com/ITSTHESHIP, www.twitter.com/ITSTHESHIPASIA and www.instagram.com/ITSTHESHIP.